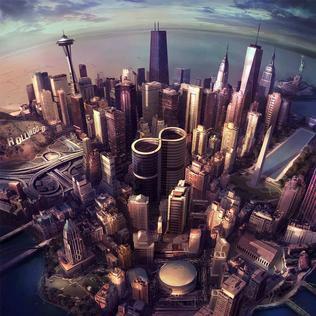 As a long time Foo Fighters fan, (I’m talking way back to the Kurt Cobain tragedy when I was just a kid, back to when Dave first formed the band, way back when they were doing covers for The X-Files soundtrack and much of their audience consisted of other X-Philes like me) I was first in line to buy their latest album, Sonic Highways. At the height of their popularity, the band created this masterpiece by traveling to eight U.S. cities famous for their influence on American music: Chicago, Washington D.C., Nashville, Austin, Los Angeles, New Orleans, Seattle, and New York City. In each city, front man Dave Grohl interviewed local musicians on their struggles and successes in the industry, and used the journal he kept to write eight songs–one for each city they visited. He turned real words and emotions into lyrics, and created songs that are a heartfelt collaboration of various stories. If you want to hear someone’s story who was interviewed, you can listen to this album and know their story. That’s a remarkable thing. After all, as The Doctor says, “we’re all just stories in the end. Just make it a good one.” The band documented this journey in the HBO series, Sonic Highways, ending each episode with a live performance of that song, the lyrics flashing on screen for an immersive reading and listening experience. You can view the song “Something from Nothing” below. This closing song on the album ends with Dave repeatedly belting out “I am a river!” Ever since I first started listening to Sonic Highways I’ve loved everything the river symbolizes: travel, adventure, progress, new beginnings, and following dreams. This album transcends music-making and proves that Dave is not only a musician, but a writer–a creative visionary. But beyond the musical and lyrical prowess of this album, I have to applaud Dave Grohl and the Foo Fighters for stepping up above the status quo, and creating a new way to go about making albums. Dave has said in the past that he’s no fan of doing things the same way over and over again–why do anything at all if you’re not going to get bigger and better, and push the limits of your creative endeavors every time? That’s exactly what the band does in this album and documentary. They’ve written something special. Listen to the album; watch the documentary. You won’t be disappointed. This album has so much musical fluidity and lyrical variety that it is not only one of the best albums the band has ever produced, but makes for a great writing soundtrack as well. For writers, certain music get’s the creative juices flowing. I listened to this album dozens of times during the month of November, or as it’s known in writing circles, NaNoWriMo, National Novel Writing Month, and wrote almost an entire draft of a new novel (about a road trip, of course). Thanks, Dave. I’ll write with you any time.